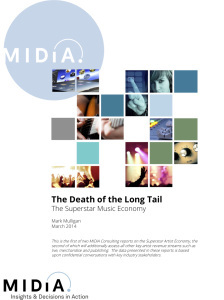 The 21 st century decline in recorded music revenues continues to send shockwaves throughout the music industry and although there are encouraging signs of digital-driven growth, the impact on artists is less straightforward. Total global artist income from recorded music in 2013 was $2.8 billion, down from $3.8 billion in 2000 but up slightly on 2012. Meanwhile artists’ share of total income grew from 14% in 2000 to 17% in 2013. But the story is far from uniform across the artist community.